Do not scratch the valve stem with the wire brush. Clean the valves of carbon, oil and varnish. Carbon can be removed with a wire brush. Varnish can be removed by soaking in Parts Immersion Solvent. Inspect the valve stem for wear (4). 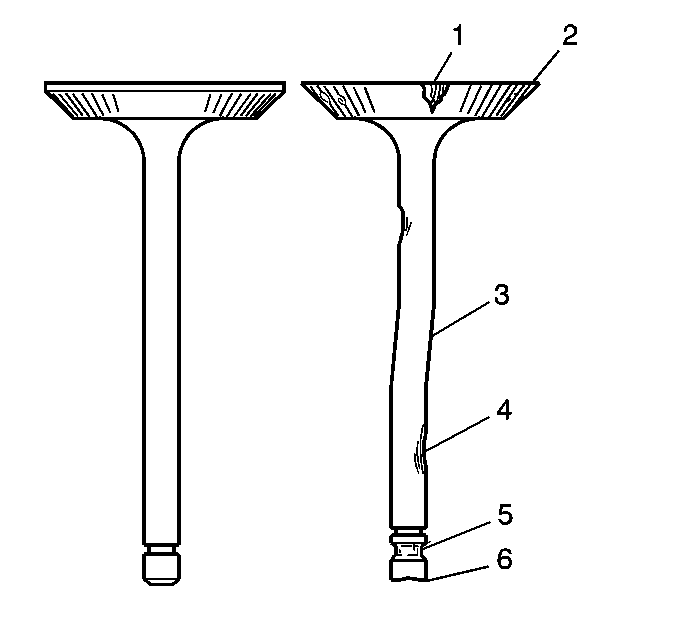 Inspect the valve key groove for chipping or wear (5). Replace the valve if chipped or worn. Inspect the valve face for burning or cracking (1). If pieces are broken off, inspect the corresponding piston and cylinder head area for damage. Inspect the valve stem for burrs and scratches. Burrs and minor scratches may be removed with an oil stone. Inspect the valve stem for straightness and the valve head for bending or distortion (3) using V blocks. Bent or distorted valves must be replaced. Clean the deposits from the valve face. Inspect the valve face for grooving. Replace the valve if the face is grooved. Valve faces cannot be machined. If worn, or damaged, the valves must be replaced. The valves may be lightly lapped to the valve seats. Loose or warped cylinder head. Missing, off location or not fully seated dowel pins. Corrosion in the seal area around the coolant passages. Chips or debris in the cylinder head bolt holes. Bolt holes in the cylinder block not drilled or tapped deep enough. Inspect the cylinder head gasket surface. Cylinder head may be reused if corrosion is found only outside a 4 mm (0.375 in) band around each combustion chamber (1). 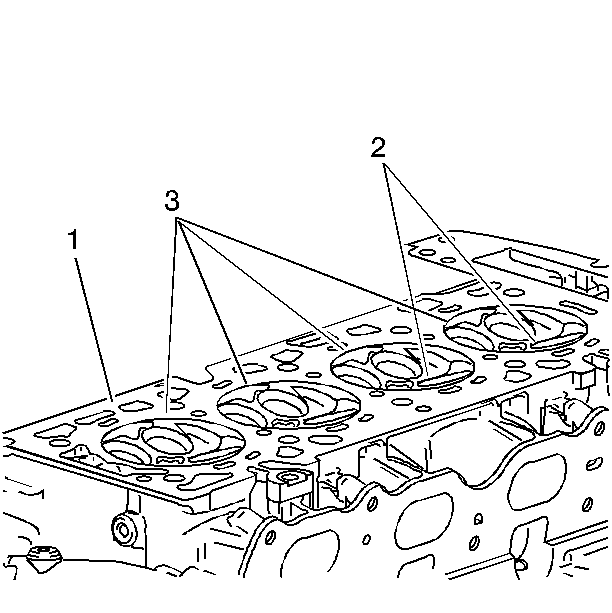 Replace the cylinder head if the area between the valve seats is cracked (2). Replace the cylinder head if corrosion has been found inside a 4 mm (0.375 in) band around each combustion chamber (3). Clean the cylinder head bolts. Do not use a wire brush on any gasket sealing surface. Clean the cylinder head. Remove all varnish, soot and carbon to the bare metal. Clean the threaded holes. Use a nylon bristle brush. Clean the remains of the sealer from the plug holes. Inspect the cylinder head bolts for damaged threads or stretching and damaged heads caused by improper use of tools. Inspect the cylinder head for cracks. Check between the valve seats and in the exhaust ports. Do not attempt to weld the cylinder head, replace it. Inspect the cylinder head deck for corrosion, sand inclusions and blow holes. 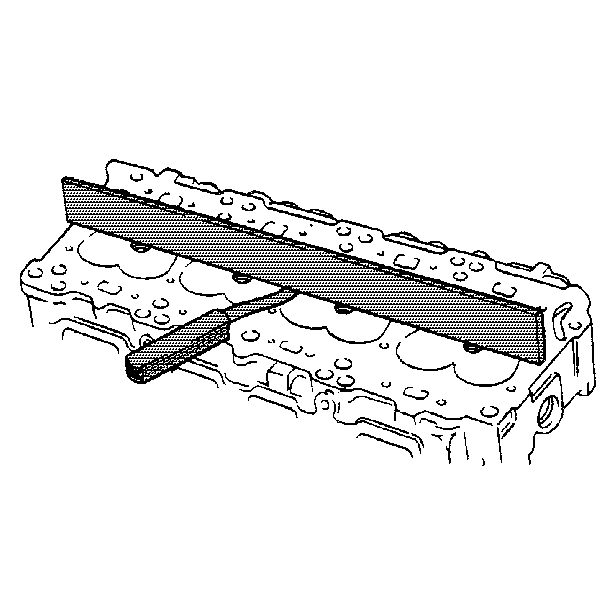 Inspect the cylinder head deck surface for flatness. Refer to Engine Mechanical Specifications. If the cylinder head is out of specification, replace the cylinder head. Do not machine the cylinder head. Inspect all the threaded holes for damage. Threads may be reconditioned with thread inserts. Inspect the cylinder head plugs.